Eggplant, it turns out, is a controversial vegetable. As many people hate it as they do love it. Yesterday one of my cousins sent me a message: I love your blog. But I HATE EGGPLANT! I have 70 first cousins, so I’m sure she’s not alone in that crowd. Another friend claims he likes eggplant but it doesn’t like him–he’s allergic, his tongue gets all funny when he eats it. Perhaps…but he’s Lebanese and I suspect he doesn’t want to admit, amid my endless raving about it, that eggplant just doesn’t do it for him. My mother and her sisters, on the other hand, would eat eggplant three meals a day if they could. The controversy continues when it comes to prepping eggplant. To salt drain or not to salt drain? This step can be important, to purge eggplant’s high water content so it won’t, when cooked in oil, absorb too much. The salt drain is also considered a good way to eradicate any bitterness. But it’s an added step that can, if done hastily or incorrectly, end up making your dish taste saltier than the Gulf of Mexico. I’ve cooked with eggplant both ways, and have read up on where the experts land on the controversy. My take is that it depends on how you’re cooking the eggplant. If you are sautéing in oil, best to drain the cut-up eggplant first so that you won’t use up half of a bottle of that expensive Stone House blend like I did once (my sister never forgave me). If you do salt and drain, leave it in a colander in the sink for at least 45 minutes and up to two hours. Be sure to rinse the eggplant and then press it dry with paper or other clean, dry towels. But for the truly delicious Lebanese eggplant dish we are making this week, you can eliminate this step. It just doesn’t make enough of a difference, given that in the end the eggplant is cooked to a meltingly soft texture in tomato sauce, with other savory flavors infused. 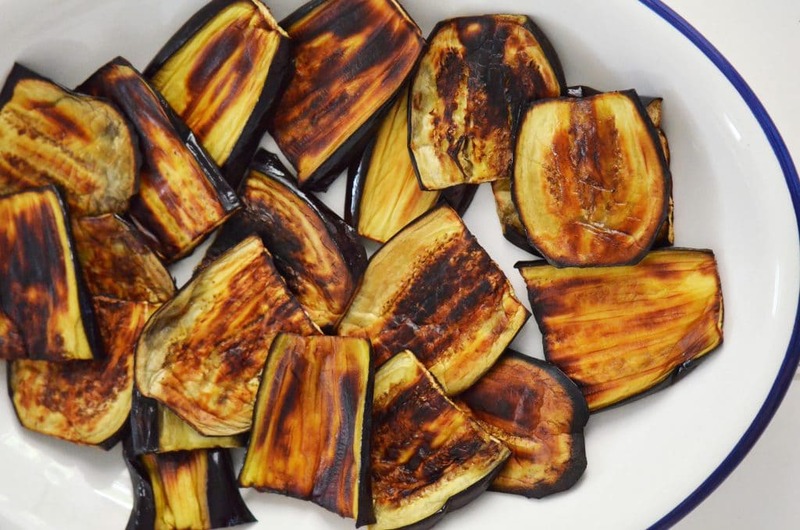 You will need to take some time, though, to broil your eggplant to a deep mahogany brown (and I mean dark). The best eggplant for this dish is Globe, which is larger than Italian or Chinese eggplant. 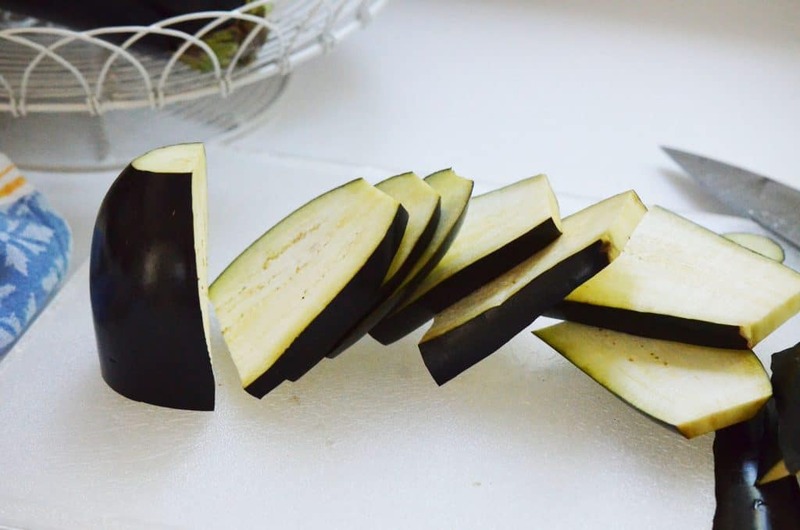 Slice the unpeeled eggplant about ½-inch thick and brush both sides lightly with olive oil. Place on a baking sheet under the broiler until the tops are golden, and in some spots charred, about 6-8 minutes (stay nearby and keep an eye on it). Flip the eggplant over and do the same on the opposite side. Alternatively, you can bake the eggplant in a 400 degree oven, on the upper shelf, for about 20 minutes. I wish you luck trying not to eat up the eggplant just as it is like this, with some thin pita bread and a salt shaker handy. 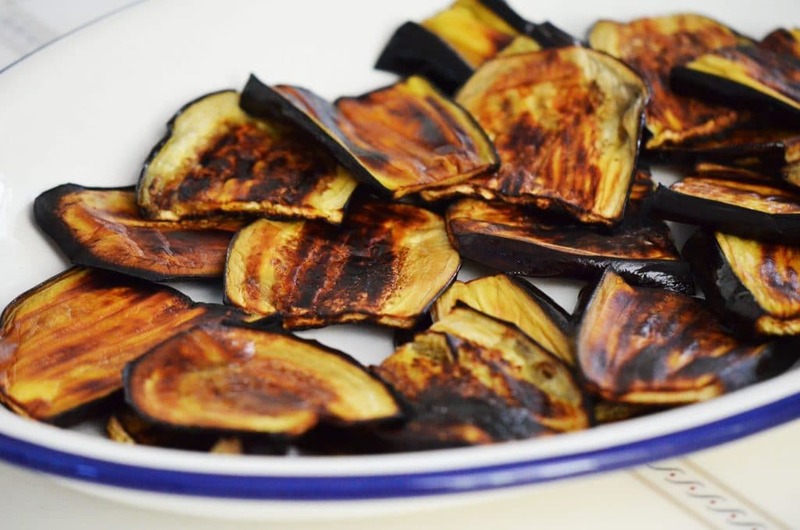 If you can, make some extra so you won’t feel bad about not leaving enough eggplant for the Sheik al Mehshee, which is even more delectable than the roasty eggplant with bread and salt. I’d like to believe that even the eggplant haters would love to eat Sheik al Mehshee, that if I could just get a bite in their mouths they would agree to its deliciousness. Probably best though if I just agree to disagree, and invite all of you eggplant haters to join me here this week anyway, for a little story that won’t leave a bad taste in your mouth. I promise. 15 Responses to "Technique: How to prepare eggplant for Sheik al Mehshee"
I cannot yet say that I hate eggplant because my mother (your beloved Aunt Sheila) never prepared it when we were growing up. Could that be because Sitto, Aunt Hilda or Aunt Helen never taught her how? Or is it more likely that she counts herself among those who dislike eggplant? I don’t know but I will ask. I hope my mom and Aunt Pat will come and see you this week—see if she’ll let you serve her some broiled eggplant! We’ve got to get you some eggplant to try, cousin! Eggplant was one of Aunt Hilda’s specialties. Hmmm. I suspect we have an eggplant hater in Aunt Sheila….. I had a great eggplant roulade dish in Lebanon and the lady who made it told me she soaks the eggplant slices in milk. I posted this dish, it is super easy to make and has basil and feta. Otherwise, I tend to let the eggplants spit out their yukky juice for hours, even overnight! I’d love to try Sheik al Mehshee. I think I’ve had it a couple times and remember loving it! Will you be posting the recipe? Great Nicole! Recipe is on its way, this week! My Italian background must link with your Lebanese, Maureen. Just reading your recipe and words of advice re eggplant (which I LOVE!) had me adding it to my farmer’s market list for the week. Can’t wait to make Sheik al Mehshee at this perfect summer season. We’ll toast to you at the table. The Italians and the Lebanese are truly cousins, Toni! OK Maureen, I made the eggplant like you described and ate the whole thing as soon as it came out of the oven. Next time, I’ll take your advice and make two! It’s tough to get past the mahogany eggplant, isn’t it R.?! I found your website while I was searching for technques to make our big, round Syrian bread (as we called it when growing up). I LOVE your posts! They remind me so much of my summers spent in Cedar Rapids, Iowa, in my Sitto’s grocery store and at her home. Thank you for sharing the stories about our Lebanese heritage. Denise, how nice! Thanks so much. We always called it Syrian bread too…. Hi Maureen…I will post a picture next week of my daughter, Michelle, making bread with her great grandmother, Freda. The local newspaper published a very nice story about the bread and tradition. We cannot let our Lebanese traditions fade away. Hi Maureen! I love sheikh el me7sheh. The only thing that makes me crazy is that most of the time, the eggplant has to much seeds and it makes the eggplant bitter. Do you have the same problem?